I just found this Cymb in the forest, it so beautiful. Each spike have 2 to 8 flowers. It have very thin leave (0,7cm) but long (up to 80cm). The colour so nice to me. I try to find ID of those Cymb and I found 2 name on internet have photos look similar but I dont know exactly name I should take. Please help me to have a final one. hi, its a really nice one, from my research i think you are correct with your id, if your plant has only 2- 3 leaves and a purple sheath, then its separated from the "kanran". That photo is outstanding! Looks like it should be a postcard. Beautiful orchid blooms. 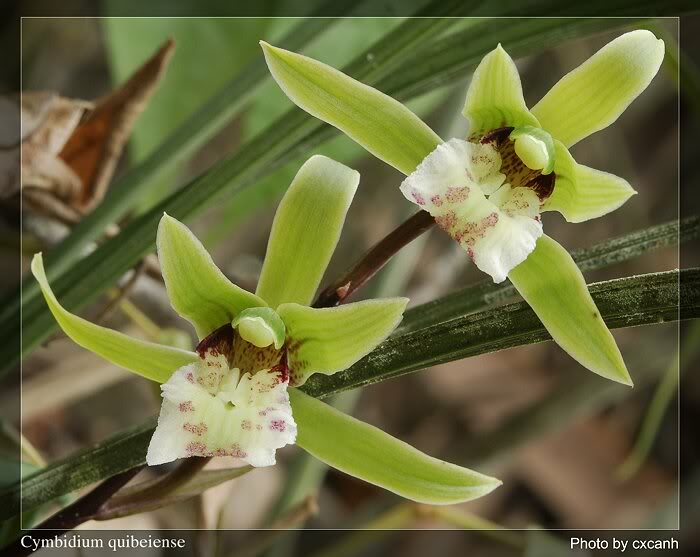 Yes, this Cymbidium just have 2-3 leave. And growing in the wild? Cool! Hi Cjconrner: Yes, the one above growing in the wild, photo I just shot in the forest last month. I think this is Tainia, let me find it's name. Thank you Truong. You forgot to take this species from my garden to add to your collection.